Published on July 30, 2013 in Educational resources and Glasgow 2014. 0 Comments Tags: athletes, bbc, Legacy, London 2012. A new monthly magazine series has begun on BBC One, seeking to celebrate the biggest names, the rising stars and the unsung heroes of sport. The first episode of “Inspire: The Olympic Journey” was broadcast on Saturday 27th July, with presenter Gabby Logan in Glasgow to mark the one year milestone to the Glasgow 2014 Commonwealth Games. The show sees the presenter receive a guided tour of the city by Glasgow 2014 Ambassador Sir Chris Hoy and visit the velodrome named after the star which will host the track cycling at the Games. It also features well-known athletes, as presenters and interviewees, looking at the legacy of London 2012 and taking a look ahead at some of the young athletes who may be the stars of future Games. The first episode is currently available on BBC iPlayer and the show returns each month, with a new selection of stars and hopefuls. 1 Year to Go Until the Opening Ceremony! Published on July 23, 2013 in Glasgow 2014 and Uncategorized. 0 Comments Tags: 1 Year to Go, Glasgow 2014. 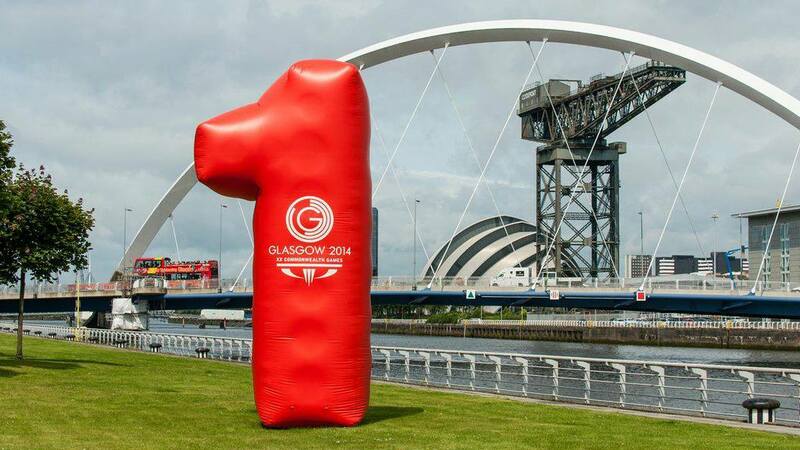 Today (23 July) marks exactly one year until the Opening Ceremony of the Glasgow 2014 Commonwealth Games. To celebrate this exciting milestone, a special 1 Year to Go film has been released which includes the ‘Big1’ tour and an exclusive athlete feature. There’s also a look back at the past year where amazing new venues made their mark on the Glasgow skyline and public support for the Games saw 50,811 friendly people apply to volunteer. Glasgow 2014 is Scotland’s biggest ever sporting and cultural event, with athletes from across the Commonwealth preparing to make history in 17 Sports across 11 days of competition from 23 July – 3 August 2014. You can make sure the young people you work with are part of the Games by joining in with the exciting opportunities available on the Game On Scotland website, with materials for all stages and across all curricular areas. On a personal level, you can show your support for the Games by joining the Glasgow 2014 ‘Sport countdown clock’, by adding the #1YTG twibbon to your Twitter account or by signing up for ticketing updates at http://www.glasgow2014.com/user/register . Glasgow 2014 will be an event like no other. Get ready to be part of something extraordinary. Published on July 22, 2013 in Award and Games Legacy. 0 Comments Tags: Celebrate Fund. 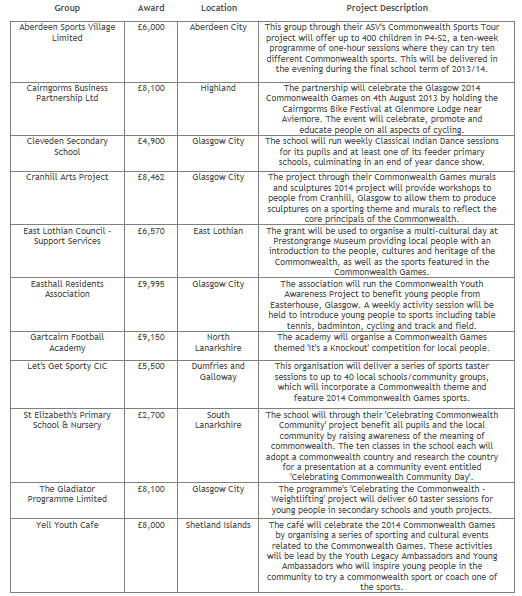 St Elisabeth’s Primary and Nursery school and Cleveden Secondary School have been awarded funding to develop initiatives related to the cultural programme of the Glasgow 2014 Commonwealth Games. Amongst the 11 project selected so far are a Shetland youth cafe, a Highlands mountain bike festival, a north Glasgow community arts project and an East Lothian Museum. 11 grants worth £74,477 are the first from Celebrate, a National Lottery funding programme supporting events and projects which celebrate Glasgow 2014 or that are inspired by the 71 nations and territories which make up the Commonwealth. Big Lottery Fund Scotland Chair, Maureen McGinn said: “This time next year the eyes of the world will be on Scotland as Glasgow gears up to host the Commonwealth Games. Celebrate has been created by Scotland’s four Lottery distributors to ensure communities across Scotland are able to share the feel-good factor of the Games and we are delighted to see these first grants showcasing a wide variety in what will be possible. Cranhill Arts Project, in North Glasgow has been awarded £8,462 to run a series of workshops with a wide range of local people enabling them to make sculptures and murals on a sporting theme. The hard work will culminate with an exhibition and celebration. Celebrate has been developed by the SLDF which is made up of all four Scottish Lottery Distributors, Big Lottery Fund, Creative Scotland, Heritage Lottery Fund and sportscotland . It is open to applications from today for celebrations of the people, places and culture of the Commonwealth and of the Games themselves. Published on July 17, 2013 in Competition, Glasgow 2014, Legacy 2014 and Uncategorized. 0 Comments Tags: Athletes' Village, athletes' village art competition, One Year to Go. With less than a year to go until 4,500 top-class athletes from across the Commonwealth take up residence in the Glasgow 2014 Commonwealth Games Village, 85% of the homes are already complete. The state-of-the-art facility will also feature a medical centre, shops, recreation areas and 24-hour dining facilities. 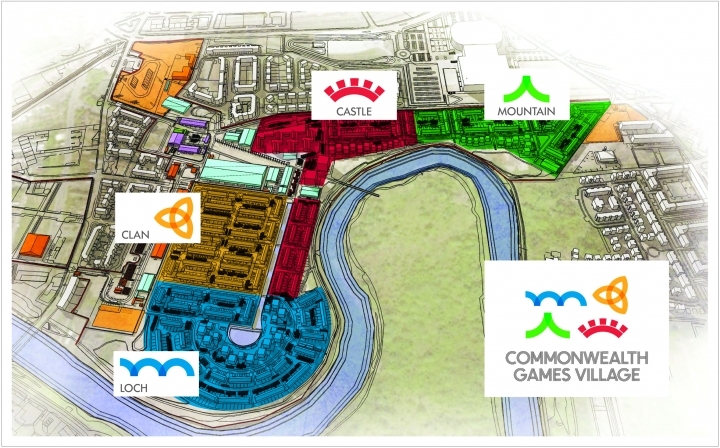 The site is Scotland’s first large-scale carbon neutral housing development and will begin its transformation for Games-mode at the start of next year. The Glasgow 2014 Athletes’ Advisory Committee has been involved throughout the design stages of the project to ensure that it is more than just a bed between training and competition. Athletes and officials will be accommodated within a range of properties – from terraced homes, to contemporary cubed townhouses – within the 35 hectare site which has been developed by City Legacy – a private sector consortium which is working with Glasgow City Council. It was revealed on Friday (12/07) that at Games-time the Village site will be zoned and has four different areas appropriately named with a Scottish flavour as Clan, Castle, Mountain and Loch. Ensuring the smooth operating of a Games village is a mammoth logistical task, requiring precision planning. In food terms alone more than 390,000 village meals will be served with more than 2,000 different menu items including 11,600 kg of mushrooms, 10,000 kg of garlic and 500,000 pieces of fruit. After the Games, the Athletes’ Village will leave a lasting legacy for the people of Glasgow as 700 homes will be available – 300 for private sale and 400 affordable houses for rental. Thanks to Game On Scotland, your school can get involved, too, by signing up to our Athletes’ Village Art Competition. Every school which takes part will have its pupils’ work displayed in the bedrooms of the athletes and officials – make sure you grab your chance to be part of the action! Published on July 5, 2013 in YOG. 0 Comments Tags: Glasgow 2018, Youth Olympic Games. The 2018 Youth Olympic Games will sadly not be heading to Glasgow, with Argentinian capital Buenos Aires the preferred choice of the International Olympic Committee. Having put together a technically excellent bid and delivering a strong final presentation yesterday, the Glasgow 2018 team were obviously disappointed to lose out, but were nonetheless full of warm wishes for the winning city. The final Glasgow presentation to the IOC had included British Olympic Association chairman (and London 2012 supremo) Lord Coe and Glasgow 2018 Bid Director Paul Bush, but also involved 15-year-old Elizabeth Pollard, with young people having been a key part of the bid since the beginning. Of course there’s still plenty to look forward to and plenty to get excited about in an educational context, with the Glasgow 2014 Commonwealth Games just around the corner – head to www.gameonscotland.org to find out more! You can view films of the final presentations and the announcement on the International Olympic Committee’s website.